View - 1420-22 W Roache St. Here's a great Buy!!!! 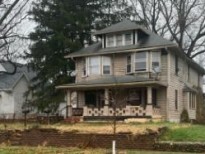 Huge double with 3 Bedrooms, Living Room, Dining Room, Kitchen and Basement on each side. You will notice the abundance of natural light from the moment you walk in the door. The tall ceilings open up the space and the flow of the layout invites you inside. Built in storage in the dining rooms and HUGE kitchen make this a must see! All of this is topped off by a nice size covered porch and a large fenced back yard with mature trees providing a nice shady oasis.